Not looking for a smartwatch? 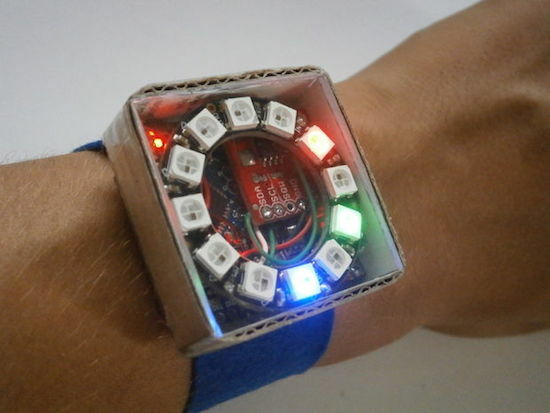 PIXIE is an Arduino-based NeoPixel wearable device that not only keeps time, but will also keep your geek cred intact. You won’t find any numbers on this watch; instead, PIXIE uses LEDs to reveal the time–hours in blue, minutes in red, and seconds in green. Beyond that, a capacitive touch switch on its strap will activate a flashlight mode. In terms of electronics, PIXIE is equipped with an Arduino Pro Mini, an Adafruit NeoPixel Ring, a real-time clock module, a lithium-ion battery, and a few other components–all housed inside a simple cardboard box with a piece of transparent plexiglass. Sound like you’d like around your wrist? Check out its Instructables page here.